To join in with Lost in Translation’s January Traces of our Past (here) I wanted to share this image of the concierge’s desk at the Jefferson Hotel in RVA. This hotel is more than one hundred years old and it has ‘traces of the past’ with some nice art all around. I do not think the photo has the best clarity, but it was one of the photos I liked more and more when I sorted the two dozen pictures I took in December 2016. I like the VIBE and the moment captured. Then the “energy” of the piece led to me feature this shot for Art Day 48. I also used a chrome filter to enrich the color. The regular version is featured in the comparison photo below. I thought I would give a bit of art analysis of this photo. Just for fun to explore the composition of this image. The horizontal of the desk gives us a sense of stability. The strong desk horizontal works in sync with the horizontal lines of the frame above the desk (with the woman with umbrella) and small piece of furniture to the right (as shown with GRAY arrows). 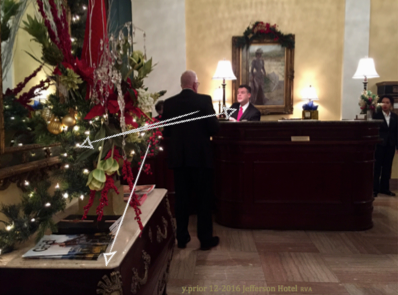 Then, there is a natural wave line that pulls the eye in from the marble stand (front lower left) – to the guy in the suit – through the line of the desk – and then our eye moves up into the verticals of the lights and the worker with the colored tie – who is maybe the subject here. The colored tie is a special little piece here – because its shape and hue work with the intensity of the floral arrangement to the left – and maybe the tiny berries to the foliage on the right lamp. The small items here combine to give flow, energy, and harmony. The white collar on the colored tie guy’s shirt has a small sorta V-shape that works with the V-shape on the lady’s white shirt – very far right. All the while, the eye is soaking up the heavy colors and organic shapes found in the left third of this photo. The entire third section is organic and rich with an arrangement of spikes of flowers, berries, lights, etc. The shape of the reflection in the mirror might also work in sink with the V-shapes from our employee shirts. But that reflection brings more light into the picture, softening that side, and bringing harmony with the similar colored tan walls. And then – the eye might move to the floor – with a squared pattern in the tile and little details can be soaked up. The two feet of the man to the far left maybe plays with the open spaces in the elbow creases of our lady with parasol in the painting. The vertical (from the posture of the lady) subtly works with the other verticals in the piece (stripes on wall, lamps, 3 people who are staggered in height, and maybe even the stripes in the large floor tile directly pull the eye to and from the tile and the lady). The shape of the parasol has a nice round vibe that interplays with the top of the frame, flowers near lamp on right, and arrangement to the left. The opened parasol is downward – giving us a sense of staying inward – and focused back on the lights and throughout the frame. Further, the bit of light in the back of the lady brings depth into the entire composition – where the art gives us a vanishing point making the shot come alive from the extra depth – almost like an open window to the sea. That lighted shape – in back of the lady inside the painting – then brings the eye back to the light and shape reflection in the mirror (left) and the chrome filter applied to the photo showed the gold ornaments in the foliage – this was less visible in the original. Then, a bit of light from the “Grid” magazine stack on the table offers some light into the composition – giving this piece movement and energy. Faintly we also see a shade reflected in the mirror, giving extras as we explore. Adding a touch of pizzazz we have the glass ornaments dripping down, working with the wavy design of the white lights – those lights have a wavy line (sprinkling left and up- shown with GREEN arrows) that counterbalance the strong horizontals of the desk and frame above. We also have a bit of texture from the greens…. And that is why I like this photo. What about you – do you like it? Did my analysis change the way you viewed the photo? Did you notice some things I did not see? Do you like the guy’s pink tie? January 21, 2017 at .. I share the same feels too. I like the less contrast / saturate version in the middle than the first one. To me, it makes me feel like I stood there with few steps back and looking to the direction of the two persons conversing. The ornaments to the left become the second object for me to explore. They have richer details and more depth. Although this sacrifices the clarity of the “Grid” magazines on the table but to me is better as that make them less contentious with the ornament. Good balance that is. After this my eyes moved to the painting. It is by itself an isolate object to explore. That is a nice piece with its own composition and lighting on its own. I like it. Hi Tish – thanks for your feedback…. andI am going to have a post about that painting in the back. I also now think of those movies you mentioned…. Yes, I like his pink tie, it makes a statement of elegance and self-assurance, boldness even. He is the right man to see when you step in 😀 I think that you made a great job providing this analysis. Sometimes we capture something without even being aware why we did. It is a great shot and you provided a fantastic rationale. There is a slight mixup in the first paragraph with dates – years, hon, maybe you want to correct this. I am flattered that you linked it to the TS. And Yvette, you should always provide large size images on your blog. It looks great. Have a good weekend! Wow, your eye for detail is amazing. You see with such vision and are teaching me how to look even closer at art for the reasons certain painting, photo’s etc.. grab me. We liked the warmth of the photo and the reflections in the mirror along with the person on the right coming down the hall. well thanks for the comment – and it seems as if there are mixed takes on this – and my son just said his eye bounced in and then right to the foliage and out… so did H and a few others…. Hmmm, I studied the picture to learn from your analysis. I like how you break down the components of art. well I will make a zig zag diagram to see what you think. It is fun to think about why we like a photo, or a scene in life. I do like this one. oh well I can see exactly what you mean – and I could make a new diagram with the zig zag you felt. and others have a similar view with you – so this is super fun to compare and see the different takes. so don’t worry if you like it less and less…. I totally see that too…. The pink tie does draw the eye but I very quickly moved around the rest of the objects in the photo when viewing it. I do tend to like saturated photos, and I loved the saturated look of the arrangement on the left. But the desk appeared too bright in the first, and much better in the second. If this was my photo, I would have tried a different angle but through your post I can see that this angle really is effective.So your analysis changed my opinion of the photo for the better. I also like that the photo tells a story. Hi – well I agree that other angles should be tried…. and this was one of about two dozen photos I took and was about to delete, but found something worth assessing. But it is not like I would hang it up or anything. and I still like the four verticals…. and it is still a top three photo from that day – if that makes sense. Yes I also liked the Verticals! It’s a lovely photo, I can see why you like it so much. The hotel looks perfect too. I’m impressed that you managed to take the photo in December 2017, a great bit of time travel!!! Well it is not that I like it “so” much, I just found it worth keeping and then thought it was good for a little bit of analysis, ya know? and haha – I fixed the date… lol – I swear there is a little typo person that sneaks in my posts and changes a couple things…. well thanks for the honesty… and I wonder how much is mood or how much is just your personal taste, ya know?